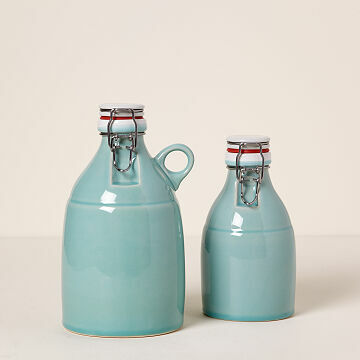 Hand-crafted in the craft beer Mecca of Portland, this stoneware growler is designed specifically for beer. For beer enthusiasts, growlers bridge the gap between the tap and the kitchen table. The refillable half-gallon jugs allow brethren of the brew to roll up to their favorite brewery or artisanal shop, get a tap-fresh flagon, and enjoy their specialty pints of the good stuff in the comfort of their own home. When poured days later, these hoppy suds taste just as crisp, and generously sized growlers help extend the amount of time drinkers can savor seasonal, limited edition, or just tap-only brews. Hand-crafted in Portland, one of the world's biggest craft beer hubs, this growler is a vessel designed specifically for beer. The hand slip-cast stoneware is coated with food-safe glazes, and since the container is opaque, a sunlit room won't threaten to skunk its tapped contents. The wide-mouth ceramic flip-top locks in flavor and fizz with an airtight rubber seal. Tops handmade in Germany. Growler handmade in Portland. Due to the handmade nature of the item, the opening size may vary; therefore, the rubber gasket on the top may be white or red to insure the growler is sealed properly. Nothing brings out creativity like brainstorming over beers. That was the intention of Brett Binford and Chris Lyons, who brought the team at their ceramics studio together to come up with a one-of-a-kind design. Over a beer (or three), they were inspired by old ceramic whiskey jugs, and ultimately decided to design an exclusive growler. Brett and Chris blend their love of good brew and ceramics in Portland, Oregon. 11" H x 6" diameter, 64 fl. oz. capacity; 5 lbs. Hand wash Store in room temperature. This growler is not designed for conditioning.Do not store in warm or hot vehicle. I bought this for my husband, but I also love this product. Beer tastes great from it. Looks great when it's unused in our home. Lots of compliments when we have it filled. As a general plug for growler use, I like to drink about 7 oz. of beer at a time and can really only serve myself perfectly at home from a growler. I would to choose to buy a growler again and I would choose this product or very similar. I have used this product once to fill it up before giving it to my husband to which I was complemented on it twice at the brewery. It it beautifully crafted, and somewhat heavy. It keeps the beer cold and fresh tasting for a number of days. My sister got this for me for Christmas years ago because I am a beer-loving potter and I love it! I got compliments on it all the time in Michigan, at every brewery I'd fill it, the bartender would compliment my growler. After moving to Portland with my wife, I now make these on a daily basis! I can attest personally to the attention to quality of the product and the quality of the people who make it! Since ceramics act as a natural insulator, if you can keep it in the fridge and it will keep your beer rocking a nice temp long after you finish the last drops. Cool gift! My boyfriend loves it. He's going to cover it with stickers from all the different brewery's we use it at. This growler was purchased as a gift for my husband for Father's Day. He is a fan of craft beer and we wanted to provide him a quality vessel. I must say this growler is perfect. It is beautifully crafted and functions excellently. He could not stop smiling when our son presented it to him. Truly there could not have been a more perfect gift and I would highly recommend this growler. When my husband took it out to Far Gohn, one or our local breweries, for a fill of his favorite ginger beer, several patrons asked where he had gotten such a nice looking growler. He was happy to let them know how they too could own one. Keeps beer fresh longer ! Great product! Our friend is particularly hard to buy gifts for. He actually said "WOW" when he opened the box at Christmas. He already has a growler, "but definitely not one THIS NICE!". Delivery was right on and I really appreciated the email updates for status of my order. This was a late order for Christmas and it arrived right when you said it would. It is easy to use and looks great; not your normal growler. My friends are jealous.